A common microanalytical technique for forensic fiber characterization and comparison is color analysis through microspectrophotometry (MSP). A microspectrophotometer allows the analyst to non-destructively acquire color information and spectra of small areas of single fibers. This MSP spectrum, resulting from colored dyes and mixtures of colored dyes, can be compared with spectra from the same or other fibers. However, little is known about changes in dyed man-made fibers that result as an effect of environmental conditions, especially exposure to ultraviolet (UV) radiation over long periods of time. This research will use a microspectrophotometer to study the effect of ultraviolet radiation on a variety of dyes commonly used to color fibers. Fibers will be monitored and sampled every eight weeks for MSP analysis over an 18-month period of exposure to artificial UV radiation in the laboratory (following ASTM G154-12a guidelines) and real sunlight outdoors (following ASTM G7 guidelines). Changes in visual color and spectral changes detected and plotted by the microspectrophotometer will be statistically and visually evaluated for differences attributed to the photodegradation of the dyes. Approximately 60 known, dyed, textile fabrics will be exposed to UV radiation for the duration of the study. The chosen fabrics will represent the most commonly used dyes on man-made synthetic fibers. Fabrics will be selected from a reputable and traceable fiber reference collection. 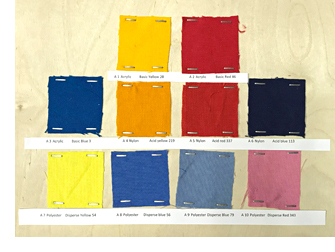 Additional fabric swatches will be custom dyed to specifications by a textile test materials company. MSP spectra of UV-exposed fibers will include the visible and ultraviolet regions for analysis. Spectra will be collected at regular eight-week intervals and compared to unexposed (control) spectra. SWGMAT guidelines will be followed when applicable. This study will provide an applied practical understanding of how ultraviolet radiation can affect the dyes and color of fiber evidence and improve the discrimination, identification, and individualization of man-made polymer fiber products for the forensic scientist. This project is supported by Award No. 2016-DN-BX-0145, awarded by the National Institute of Justice, Office of Justice Programs, U.S. Department of Justice. The opinions, findings, and conclusions or recommendations expressed are those of McCrone Research Institute and do not necessarily reflect those of the Department of Justice.